A common misnomer is the term “hot water heater.” If the water were already hot, it would not need to be heated. The correct name for this appliance is just “water heater,” and most homeowners will need water heater repair during the time they own their home. There are two primary water heater repair situations that affect electric water heaters. Both of them require the purchase of inexpensive parts and some understanding of how mechanical things work. Here are the basic problems that require water heater repair. There is an attachment in the top or near the top on the side of a water heater called the “pop off.” The more proper term for this is “pressure relief valve.” A water heater repair may be necessary if the pop off becomes defective, and this is a common occurrence. The valve can become weak over time or grit can get hung in it causing the valve to stay partially open all the time. If the thermostat controls of the water heater heating elements are set too high, this can cause the pop off to open regularly. A good rule of thumb is to limit the temperature to no more than 140 degrees. If the pop off still discharges water after that, it is probably faulty. The water heater repair of replacing the pop off is very simple. Purchase a valve that is designed to fit into your brand of water heater. Turn the water supply off and open a tap on the hot water side to release the pressure. Disconnect the drain line, and with a pipe wrench, unscrew the valve and put the new one in. Be sure to tighten it so it won’t leak, reattach the drain line, and your water heater repair is finished. General duty water heaters typically have two heating elements, which are located on the sides of water heater behind a panel. One is located high on the side and one is located low. Water heater repair of this kind happens when the element burns out and won’t heat the water. It is generally the case for water heater repair when there is suddenly not enough hot water to get a bath. Most times, water heater repair of heating elements is only necessary for one element, but it is best to replace both while the water heater is drained because the other will be nearing its life’s limit, too. Instead of fixing the water heater twice, the heater will only be down the one time. 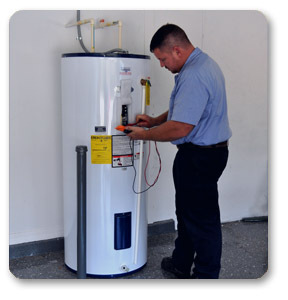 Check with a plumbing supplier in Tampa, FL and get the correct replacements for your water heater. The heating element screws into the side of the water heater and has a gasket to keep it from leaking. After draining the water heater (always turn the power off before doing this) remove the screws and electric wires from the old elements. When you pull it out, it is easy to see that the section that goes into the water has burned. Put the new elements on and make sure screws are tightened and the wiring is attached the same as on the previous parts. Completely fill the water heater before turning the electricity back on or you will burn out the new elements; they must have water around them to keep this from happening. Water heater repair is not possible if the lining of the heater is leaking. A rupture in the tank requires replacement of the heater. Water repair is much easier if you just call an experienced plumber in Tampa. PUR Plumbing in the Tampa area is always on call for water heater repair and all other plumbing needs. They are prepared to get the job done quickly and as affordably as possible. The friendly and professional staff at PUR Plumbing can also tell you if it makes more sense to replace your old heater instead of going through the process of water heater repair. Call for your quote today.